I’m the proud owner of a MiniVNA for quite a few years already. One of its features is that you can use it as an RF signal generator. However, the output power cannot be adjusted, so I needed an attenuator. I could build one myself of course, but for about the same amount of money you can buy a kit at the dutch web shop of Kent Electronics. I never tried their kits before, so I decided to give it a try. 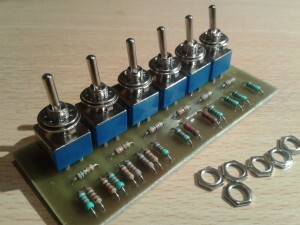 The kit is a classic attenuator with six sections, each section containing a Pi-circuit of selected resistors and a switch. Each switch allows you to include or bypass the corresponding Pi-section. The sections of this kit are 1, 2, 3, 4, 10 and another 10 dB, which makes up a total of 30 dB. The impedance remains 50 ohm, whatever attenuation is selected. Of course you can skip the included resistors and select your own values. 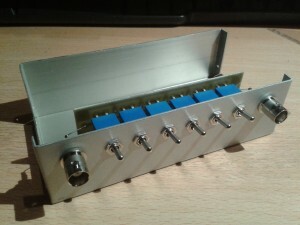 My club member Bert PA1B has been experimenting quite a lot with attenuators, so please read his blog for more information on this subject. 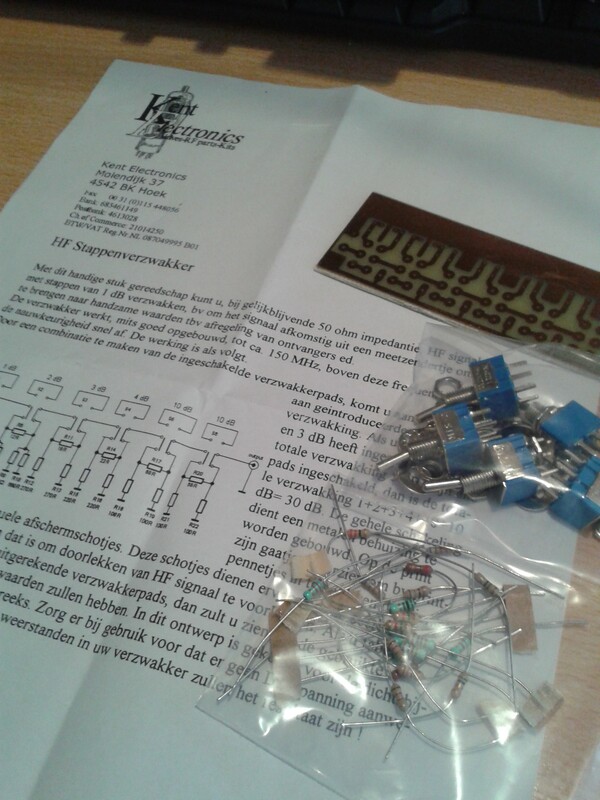 The kit contains a single-sided circuit board, a bunch of resistors and switches, and a single sheet of paper with some information on the kit. The circuit board is not drilled; case and connectors are not included (as stated in their catalog). There are no building instructions. However the documentation includes a circuit drawing, represented in the same layout as the circuit board. 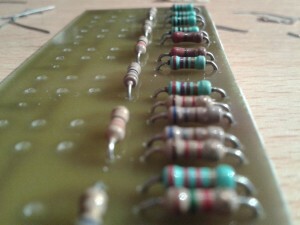 After drilling the holes in the circuit board I placed all the resistors. Next I put the switches in place, but did not solder them. First I determined the distances between the switches and drilled the case to ensure all switches will fit. Then I put the print with switches inserted into the case., aligned all switches and soldered them on the PCB (while in the case). Finally I fixed the switches to the case using the included nuts. Circuit of the step attenuator. Always start with the resistors. The switches are placed on the circuit board, but not soldered yet. 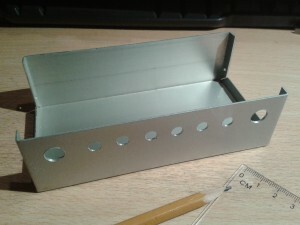 This metal case will hold the circuit (not included in the kit). As you can see, the attenuation is not very precise. This is not a big surprise, since the resistors do have a 5% tolerance. 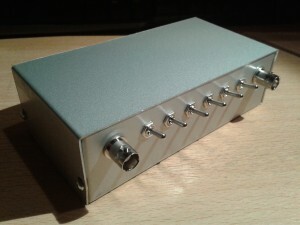 If you want a more precise attenuator, forget the packaged resistors and select your own values. There is some strange behaviour: when adding all the individual attenuations together for a certain frequency, the sum is less than the attenuation with all sections enabled. For example, at 14 MHz the sum of all individual sections is -28.4 dB, with all sections enabled the attenuation is 29.2 dB. I’m not sure if this is caused by the attenuator itself, or by the MiniVNA (which is a great tool but definitely not the best/most accurate VNA available). Although the kit is meant for HF purposes only, I also measured the attenuation on 50, 70 and 144 MHz. As you can see the results get worse. The circuit board allows you to shield the different stages by inserting grounded sheets between the switches. This will make it suitable for VHF as well, as stated by the documentation. Hallo Ernest, heb even je project gelezen en ga ook een bestelling doen bij Kent. Wat ik me wel afvraag is het kastje wat je hebt gebruikt, heeft dat een naam en leverancier? The case is made by Teko, model 4/B.1. It’s made of 1mm aluminium sheet and measures 143 x 72 x 43mm. Teko is a wellknown brand for enclosures, available at most common electronics stores like Conrad or Reichelt. I also used this type of case for my 30m QRP transceiver. ik heb de bouwkit hier ook nog liggen. maar moeten daar geen blikken afscherming platjes tussen de schakelaar’s. According to the building instructions, the shielding between the switches is optional. I left them out, since I didn’t have proper material available. The measurements show that it’s ok up to about 30 MHz.